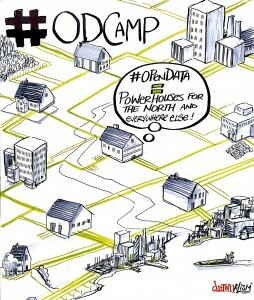 It’s nearly two weeks since the second UK Open Data Camp – the unconference devoted entirely to open data. The first Open Data Camp was held ‘down South’ in Winchester, and this time headed ‘up North’ to Manchester. The hosts – Digital Innovation (part of the Manchester Metropolitan University) – have a brilliant venue called The Shed, which is just a few minutes walk from Manchester Oxford Street and Piccadilly stations. 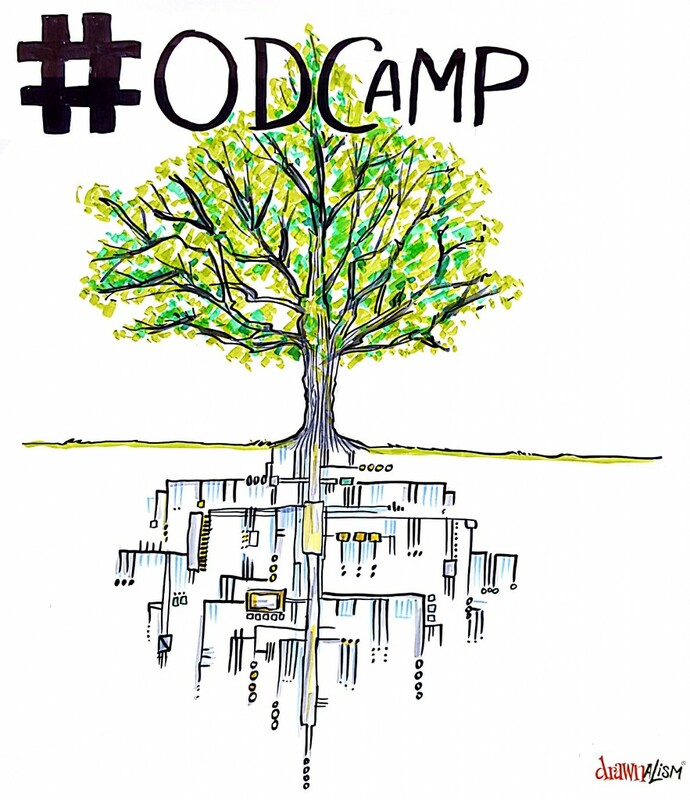 Having encountered some travel problems with the first event, when planning the dates for ODC2, we carefully avoided Manchester’s regular football fixtures. Our cunning planning had a flaw, however, as we found ourselves up-against TWO major rugby events AND a boxing match which we hadn’t known about earlier in the year. Despite the clash – and resulting traffic, transport, and accommodation chaos – there was a good turnout on both days, albeit after a bit of a slow start, particularly on Sunday*. The choice of dates, combined with lurgies, also meant that several of the organising team couldn’t make it, and we sorely missed James Cattell, Lucy Knight, Hendrik Grothuis and Pauline Roche. We were fortunate to have Julian Tait on the organising team this time, who worked tirelessly with Jamie Whyte to make all the local arrangements, including sorting out discounts at nearby eateries. Julian also organised super-speedy printing of the T shirts, which he collected on Friday, and ran an excellent session on crowdsourced Internet of Things. Having been local lead for the first event, I rather enjoyed being in the background this time. Jamie Whyte wasn’t so lucky, and ‘was volunteered’ to step into James Cattell’s shoes as facilitator. I must say, Jamie did a marvellous job, at very short notice. Glancing through the list, I was reminded of the elements as imagined by ancient philosophers: Earth, Water, Air and Fire. There were sessions about three of those – Earth, Air and Fire. As a slight aside, it’s interesting to see the classical elements visualised as layers as early as 1617 in this copper engraving on paper. The other classical element – Water – is rather conveniently the topic of new latest Geovation Challenge, which seeks to tackle the global issues around water. As with the first Open Data Camp, I was really pleased to note that this wasn’t ‘just’ people ‘talking-up’ open data (although, there was some of that), or talking tech (although there was some of that, too) – it was also people finding and showcasing ways to use open data and associated technologies to overcome real-world issues like poverty, education, food banks, and health care. If you were at Open Data Camp 2, you may have noticed the complete lack of hard sell (in fact any selling) by the sponsors, all of whom just wanted to help make Open Data Camp happen, and do their bit for the open data movement. Open Data Camp wouldn’t be ‘a thing’ if it wasn’t for organisations who are prepared to help cover the costs of free events. On behalf of the organising team, I’d* like to express our huge and sincere thanks to the sponsors, particularly our hosts Digital Innovation, and main sponsor the DaPaaS Project. As usual, I was torn between which sessions to go to, as they were all really interesting. I don’t have time to go into detail in this post, but I was particularly impressed that Minister John Shimmin and Kirsty Hemsley from the Isle of Man Government was prepared to attend to seek advice from the open data community on ‘how to do open data right’. I was only present for part of that session, and I hope that someone will blog about it in detail. I was also impressed that Paul Maltby – the UK Government’s newly appointed Director of Data – pitched a session on what’s happening in the UK Government around data (including open data). There was lots of interest in that session, which ended up being held in the main space with no parallel sessions, thereby becoming known as an ‘unkeynote’. The term stuck, as the (nearly) final session on Sunday was a fascinating and highly entertaining talk from Dr Bob Barr about the ongoing battle for UK Addresses, now known as the Address Wars. 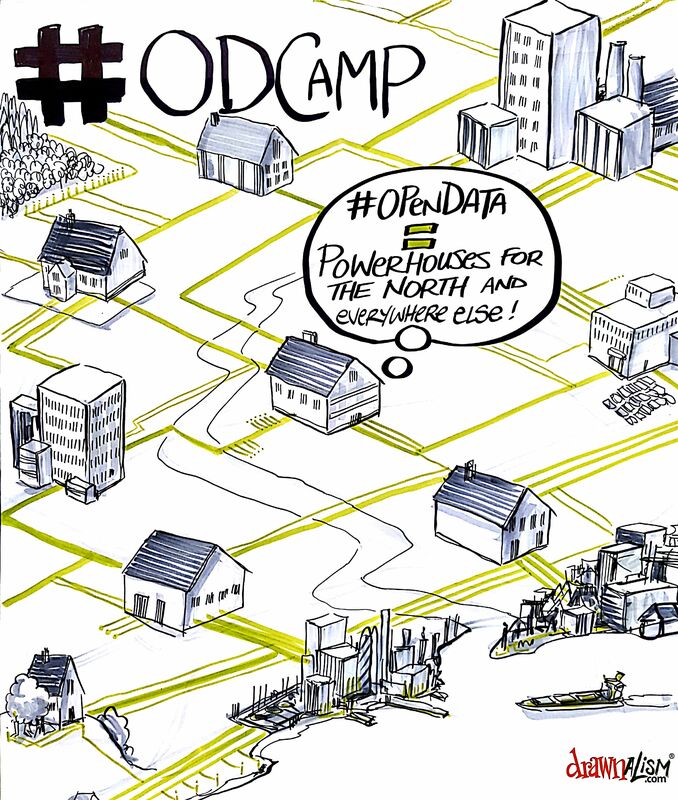 I’m enjoying reading the blog posts and other output – including photos from Giuseppe Sollazzo and Sasha Taylor – from Open Data Camp, which we’re signposting to from the Open Data Camp home page. It’s really useful to have a record of what was discussed. So often, it’s these stories which become valuable resources to call upon in the future. On which note, I’ll also be including them in the mix over on Open Data Aha! Copyright © 2019 AHA Digital. All Rights Reserved.